Housebreaking any puppy can be frustrating. When it's a really big puppy, it can be especially difficult. Your Mastiff puppy may be intimidating, strong and stubborn, but they're also loyal, gentle companions. Going through potty training is well worth the reward of gaining a loving, well-mannered family member. With a little knowledge about potty training and the Mastiff breed, housebreaking is easier than it seems. Purchase a crate for your Mastiff puppy. The crate should be large enough so that the puppy can turn around and lie down. Don't be tempted to get a larger crate. Your Mastiff puppy may potty in one side of the crate and sleep in the other. You should put the crate in a location where you can see your puppy and he can see you. This will help in training while building a bond with you and your family, as Mastiffs are a social breed. Place your Mastiff inside the crate with one or two toys and a bowl of water. Mastiffs are a wet-mouth breed, so water should always be made available. Chew toys are also important to keep your Mastiff puppy happy while teething. You should also put a soft mat, towel or bed in the crate for your puppy to lie on. Leave your Mastiff puppy inside the crate for short periods of time. Most puppies need to potty six times a day, so break that into 24 hours. Leave the puppy in the crate for four hours. Take the Mastiff puppy out of the crate and affix his collar and leash. Take the puppy outside and walk him until he urinates or defecates. Do not talk to the puppy or distract him. Reward the puppy with a small treat and shower him with praise after he goes potty. 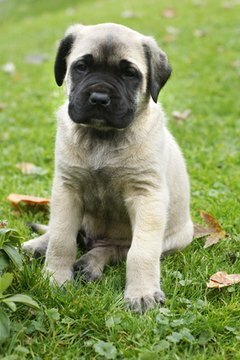 Mastiffs require a fair amount of exercise, so reward your puppy with some outdoor play as well. Mastiffs were known for protecting their masters while bear and wolf hunting. A mastiff puppy may place himself between you and other people during play. This is a Mastiff's natural instinct and should not be reprimanded. Return the Mastiff puppy to the crate for four more hours, then repeat the process of taking him outside. You must do this through the night as well, until the puppy is 12 weeks of age. Mastiffs have little to no bladder control until this age. Be consistent and stick to the training as closely as possible. Consistency is key when training this breed. Keep crate training your Mastiff puppy until he is 6 months of age or housebroken. This is because after 6 months, there are no crates large enough for a Mastiff. A male adult Mastiff can weigh up to 200 pounds. If your Mastiff is still not housebroken, continue training by keeping your Mastiff in a small room with a tall baby gate to secure him. For example, a bathroom or kitchen might work. Housebreaking a Mastiff generally takes up to a year to complete. Clean household accidents to prevent the puppy from going potty in the same spot again. Don't leave food out all day; establish a feeding ritual of twice/day. This will help control their bowel movements. Never punish a puppy for an accident that has already taken place. They do not understand what they've done wrong after the fact. Do not stick your Mastiff puppy's nose in his accident. This ploy is myth that will do nothing other than making your puppy ill.